We understand that not everyone is a morning person. So when you find yourself dragging your feet after a fun-filled day in the sun, it’s good to know that BuzzCatz Coffee & Sweets’ doors are open early. Ayla, one of the longtime employees at BuzzCatz, gave us some insight on the name. “The Owners fell in love with the coffee houses during a trip to Belgium,” she says. “One of the places had a cat with crazy eyes that they said looked ‘buzzed.’” Alas, BuzzCatz was born. BuzzCatz is the preferred morning stop for locals in Orange Beach. Much of the coffee is sourced from Fairhope Roasting Company right here in Alabama. And if it’s not coming from Fairhope, they are using single source vendors. Ayla talked to us about one of the favorites on the java menu. And the edibles at BuzzCatz aren’t your usual bakery items. Everything coming out of the kitchen is made from scratch — even the syrups. Even though the classic bacon and eggs is a winner, you can also try something different. Looking for something a little sweeter in the morning? 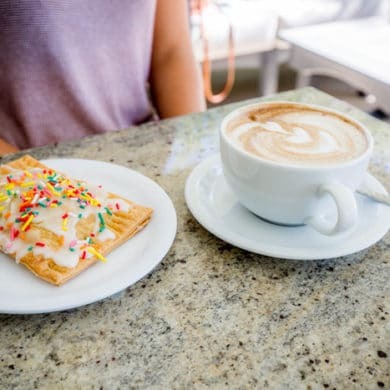 Bite into a piece of nostalgia with one of BuzzCatz homemade pop tarts! The filling is always seasonal, so make sure to ask. BuzzCatz is even sporting some impressive hardware. The team at BuzzCatz won the Golden Biscuit Award in the Knoxville Biscuit Championships — that’s a pretty clear invitation to try the biscuits. Kick your morning off by getting buzzed. BuzzCatz Orange Beach AL is located at 25689 Canal Road Orange Beach, AL. For more information or to look at a menu, visit the BuzzCatz website or call (251) 980-2899.